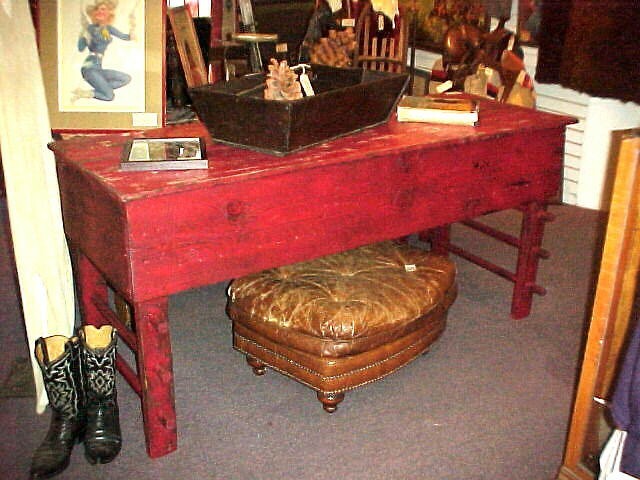 This is a beautiful 100 yr. old Storage Box painted red and some restoration wood repairs and is 6'ft long and 2'ft wide with a lid that lifts revealing three separate 2'ft areas to store items. Great barn red. This is a beautiful 100 yr. old Storage Box painted red and some restoration wood repairs and is 6'ft long and 2'ft wide with a lid that lifts revealing three separate 2'ft areas to store items. Great barn red. Please email cowboyron@cowboycabin.com with questions or call 406 270-2842.